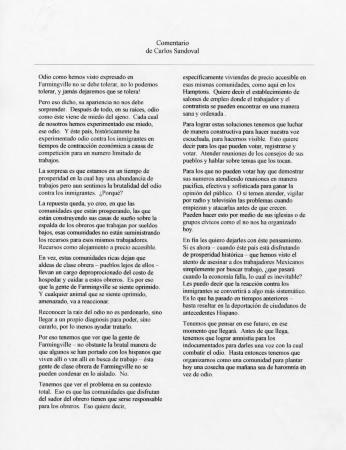 Carlos Sandoval, producer/director of "Farmingville," made this speech in Spanish at the Stop the Hate Candlelight Vigil, Sag Harbor, October 5, 2000. An English translation is on the verso. Sandoval explained what he saw as the reasons for "the brutality of hatred against immigrants" in Farmingville, proposed constructive solutions and goals, and asked, "If today - when this country is enjoying unprecedented prosperity - we have witnessed the attempted murder of two Mexicans simply because they sought work, what will happen when the economy falters - as it inevitably will?" A flyer for the vigil can be seen at: HOF_FARM_B32F13_006 (two pages). Source: Hofstra University.The Farmingville Collection, 1996-2005. Box 32, Folder 13.